• Start by folding your fabric in half, then fold it in half again (quartering it into a square). • Place a saucer about 3″ over the folded corner. Trace it with your chalk pencil and cut. • Round the bottom of the skirt by determining the length of your skirt and slide the 0″ end of the measuring tape across the cut corner, making at the measuring tape across the cut corner, marking at the same distance (22″ for the velvet skirt) all the way around until you have a round outline. Cut through all the layers. • You now have piece of fabric that is sped like a big donut if you open it up and lay it flat. • Do the same for the other fabrics you might be using. • Sandwich your fabrics together and pin them so they remain in place. Cut from the edge to the donut hole in the middle so you have an opening to get your skirt around your tree easily. 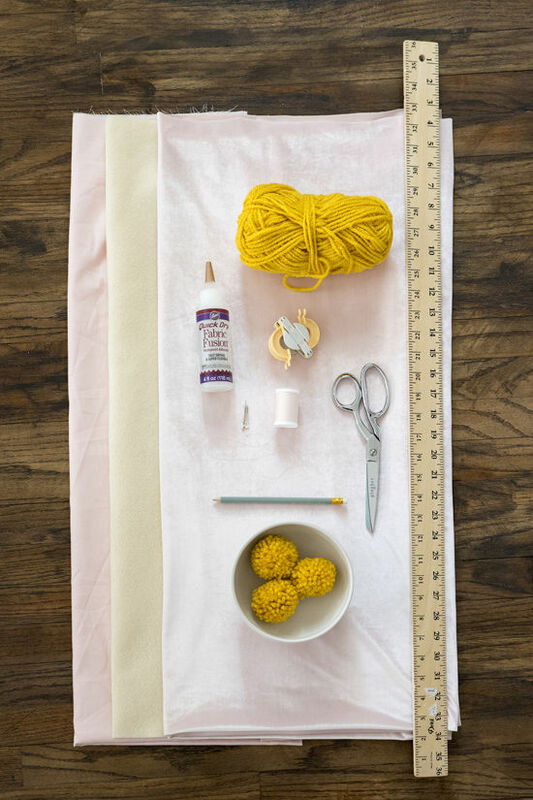 • If you’re layering your fabrics, you can use fabri-tac to place all the fabric together. We made the velvet 1″ larger so we could just wrap the excess velvet over and under all the sandwiched fabrics. You can also sew here but since this is not an item that gets a lot of wear, gluing will be fine and save you a lot of time. 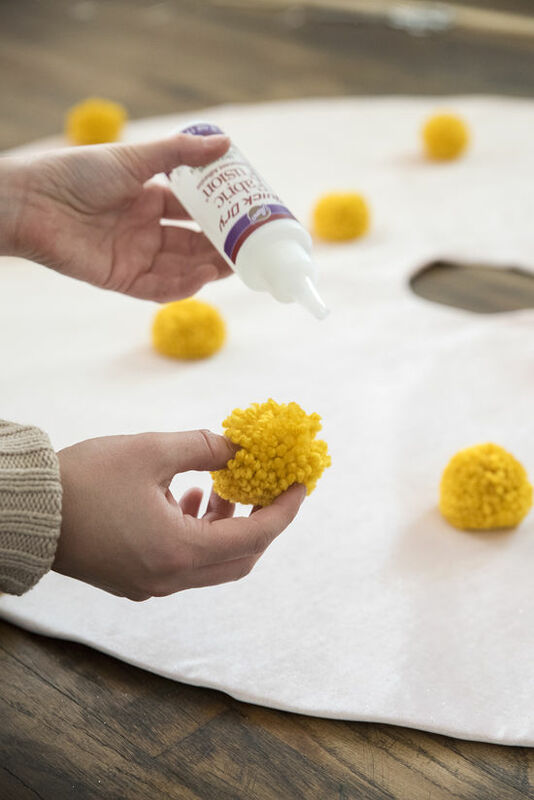 • Now make some pom poms! see the DIY post for those right here! 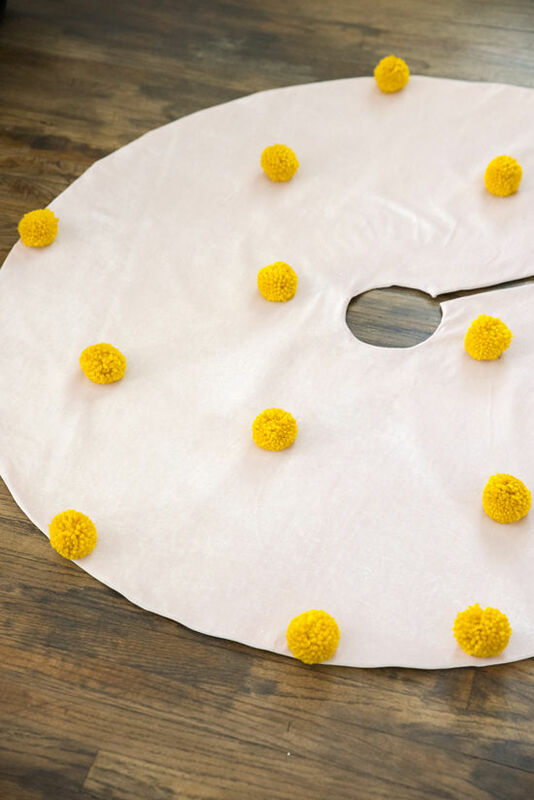 • Once you have all your pom poms made, you can play with how they lay on the skirt. Once you decide where they’re going to go, you can either glue or sew your poms on. Boom. Now you have a fun, bright, cheery new skirt for your Christmas tree. Enjoy! I bought fabric for a tree skirt just two hours ago! By the way… I am from Greece and your slippers look very Greek to me! they are! wish i had more of them! Love this as an extra way to add some fun to the tree! 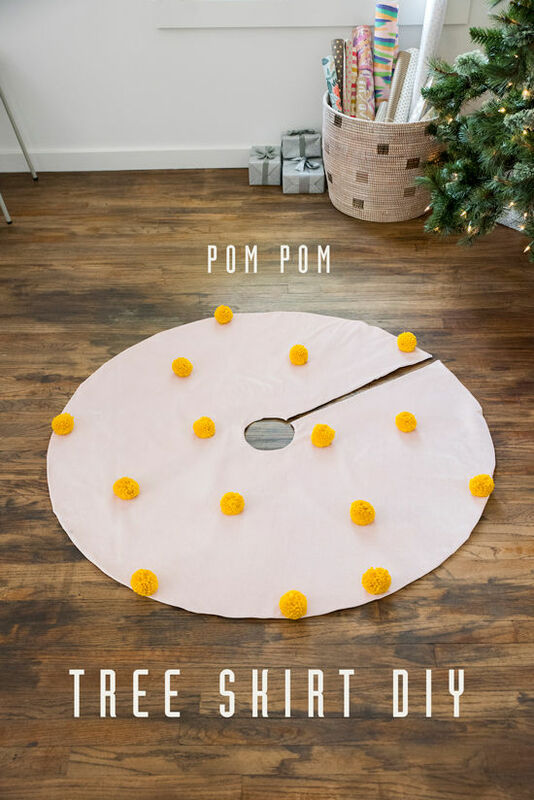 The DIY project I have been waiting for, I have been searching for a cute/fun tree skirt for years! they are so hard to find! hope yours turns out great! Bri, where are those fabulous slippers from?! a friend brought them back for me from Greece! 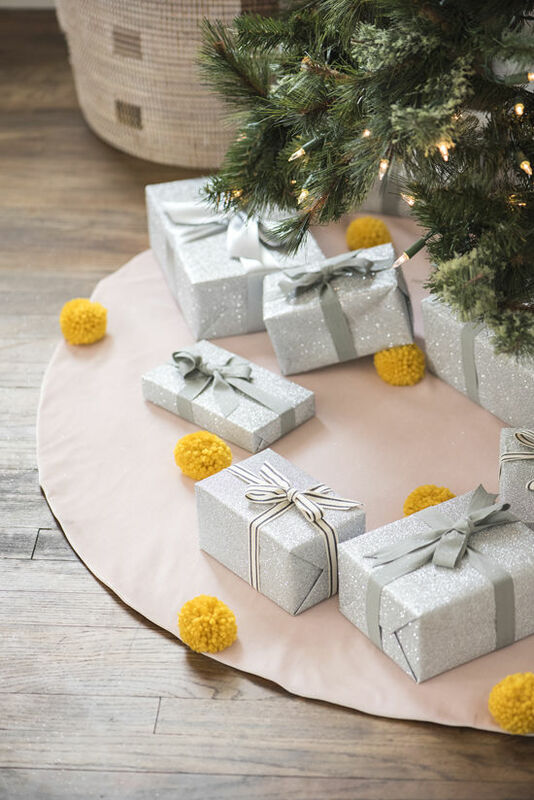 I have been wanting to make a tree skirt for years – but my sewing skills are basically non existent. This looks like something I could totally do – and is super cute. Right now we just have a blanket wrapped around our tree base, haha. Amazing idea! Perfect timing! Thank you! 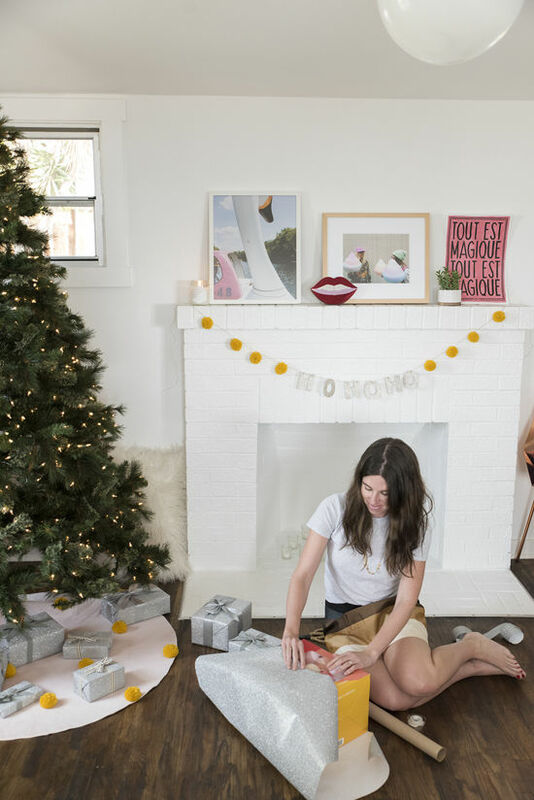 I always love y’alls holiday DIYs…they are the best–keep em comin! PS where are you glittery HOHOHO letters from on your mantle!? 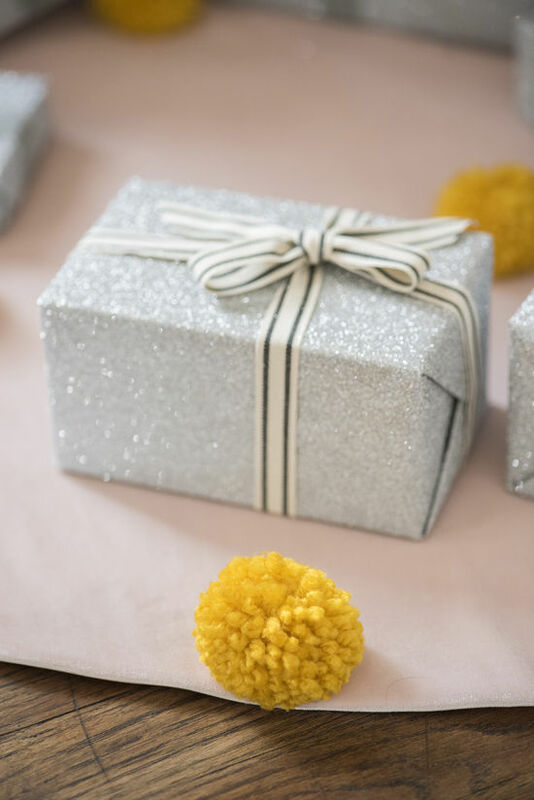 Decorating for Christmas with two cats is quite the challenge… has the Pom Pom skirt been kitty tested? hi colleen, unfortunately, it has not been kitty tested!